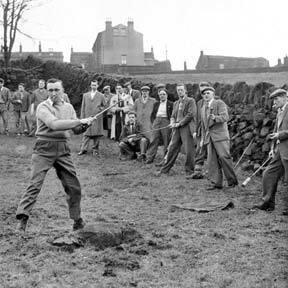 As late as the 1970s, a sport peculiar to the north of England was still being played in the Calder Valley. Knur and spell – more usually billets or billeting, a variation of the ancient game played locally, attracted huge support in its heyday, with hundreds of pounds changing hands. Knur and spell is believed to have originated in medieval times and was often played on Shrove Tuesday and Good Friday. It could be even older: the name derives from the Norse for ball game – “nurspel,” indicating that it may have come over with the Vikings, although “spell” is also a North Country word for a piece of wood. A field near Mytholmroyd Cricket Club was the setting for local billets handicaps, usually held on the Sunday after the gala. 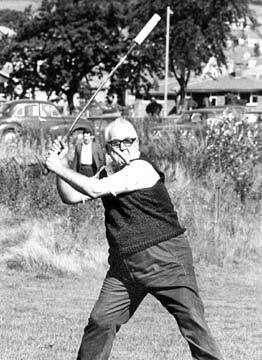 Tommy Crampton shows how it’s done in 1961. ALGC. The game was at the height of its popularity in the 19th century, played mainly in South Yorkshire and Lancashire. Billets, or billeting, acquired an equally enthusiastic following in the Calder Valley area where players congregated on any large open field and competed for prizes such as copper kettles. 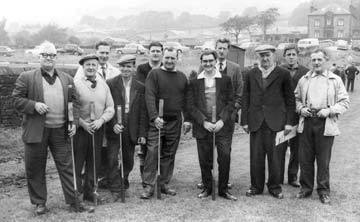 Interest dwindled as wages rose and working men were able to afford to indulge in sports such as golf. There are still many, however, who have fond memories of knur and spell: truly the games of the labouring classes.